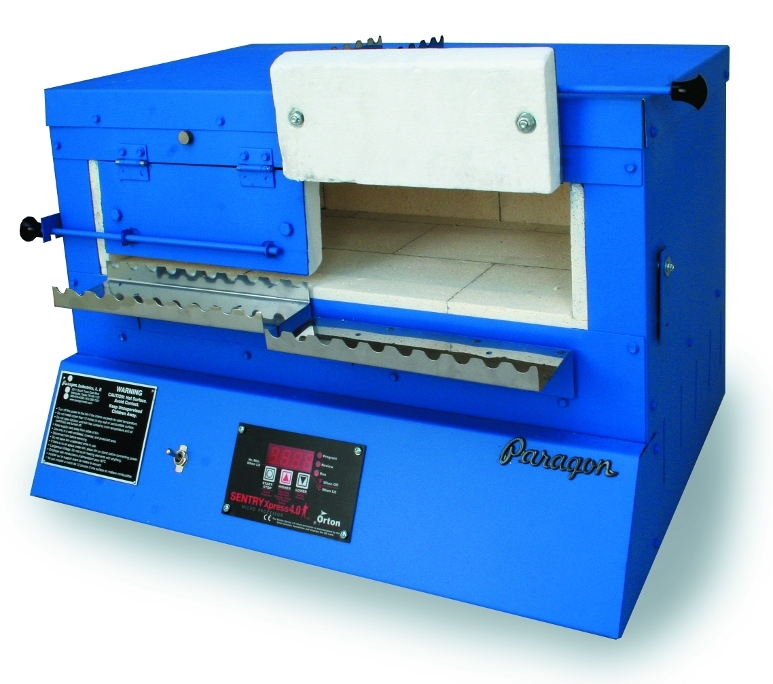 The Paragon BlueBird XL is a dream kiln for the glass bead enthusiast. This 20" wide, 9" deep kiln safely anneals glass to prevent breakage during cooling. 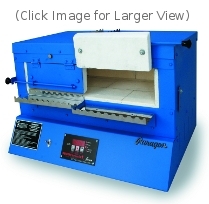 With your own Paragon annealing kiln, you will never again worry about glass breakage. The kiln opens doorways of opportunity in beadmaking. The 10" wide double doors give a total of 20" width for inserting bead rods. This kiln is ideal for seminar teachers. It is like having two kilns instead of one. The BlueBird XL has a user-friendly 3-key Sentry Xpress digital controller. It maintains the annealing temperature that you program for the length of time desired. The controller is packed with features but is so easy to use that your child could program it. The BlueBird XL has durable insulating firebricks in the walls and floor. The element is mounted in the roof and embedded between two layers of ceramic fiber board. This reduces dust inside the kiln. The BlueBird XL now comes with two types of doors: a 10" x 4" short door and a 10" x 4 1/4" tall door. The 10" x 4" short door has a 1/2" gap under the door and includes a double mandrel holder. Place bead rods on the mandrel holder, which cradles the rods at two points. Because of the gap, the door remains closed even with bead mandrels in the kiln. Adjust the height of the mandrel holder by loosening screws underneath. The bottom of the 10" x 4 1/4" tall door, in the closed position, is flush against the kiln floor. An adjustable bead mandrel holder supports the bead mandrels at a single point. The standard BlueBird XL comes with a short door on the left and tall door on the right. However, you can order your kiln with two short doors or two tall doors. The doors are interchangeable, so you can reverse the doors of a standard BlueBird XL later. As you can see, this is a versatile kiln. Side latches hold the doors closed while the kiln is heating to annealing temperature. Phenolic knobs on the door handles stay cool to the touch. Rare-earth magnets hold the doors open when needed. A safety switch on the front panel turns off power to the controller when the kiln is not in use. We have added a stainless steel glass rod warmer on top of the kiln. Pre-heating glass rods saves production time. The steel base supports the kiln in two layers. The upper steel base supports and strengthens the firebrick floor; the lower steel base covers the entire kiln bottom where it rests on your worktable. Electrical components are mounted to the lower base, away from the heat of the firing chamber. To save table space, the Sentry Xpress digital controller is mounted under the kiln in an ergonomic sloped panel for easy operation. The built-in base stays cool even during extended hold times for the long life of the electrical system. It is slotted to dissipate heat and comes with mar-proof plastic feet. The Blue Bird XL plugs into a standard household outlet. The kiln ships by convenient UPS. It ships in a special carton with vacuum-formed padding to assure that the kiln will arrive safely. And, of course, the BlueBird XL is made in America to exacting standards. The kiln is coated with durable high-temperature water base paint, which produces low emissions during spraying. This is better for our employees and the environment. The controller is so easy to use that your child could program it. The kiln includes a Quick Start programming guide and a 16-page controller instruction manual, printed in color.